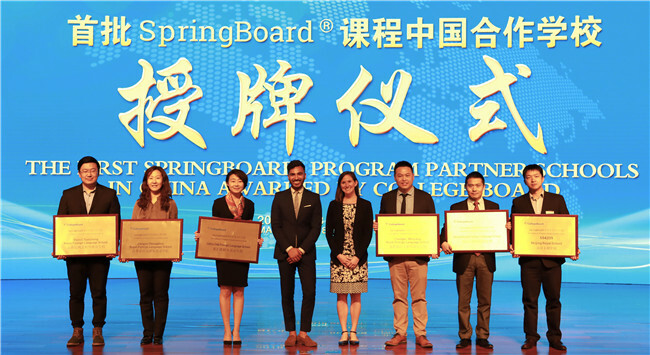 On May 8, 2018, Beijing Royal School (BRS) invited representatives of the College Board to campus to participate in the official launch of an exciting educational initiative. At the ceremony, Ms. Carol Choong, Director of China Market Management of the College Board, and Mr. Wang Guangfa, President of Beijing Fazheng Group and Dalian Jiahui Education Group and Principal of Beijing Royal School, jointly announced that Fazheng International Education has been named an international school district authorized to implement the College Board’s SpringBoard Program at BRS and in its network of branch schools. SpringBoard, is an innovative educational program designed to prepare all students in Grades 6 to 12 for success in rigorous Advanced Placement and university courses. The ceremony marked a significant new milestone in the twelve year partnership between BRS and the U.S-based College Board.